This industrial strength pot and pan detergent is highly concentrated and formulated to remove greasy soils from pots, pans and utensils. Dawn Pot & Pan Detergent is made from a blend of surfactants that provide the power to cut through and emulsify grease. Long lasting suds provide greater cleaning capacity with 35% less sink changeover, reducing labor costs and hot water usage by 6,000 gallons per year. Dawn's professional formulation allows users to clean 58% more greasy dishes, pots and pans than the leading competitor, reducing the cost per use. This mild, yet very effective detergent is ideal for use in commercial settings as well as residential homes. 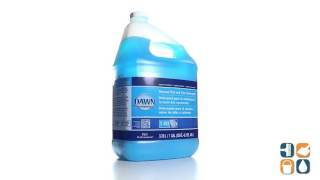 In addition to all of its benefits, Dawn Pot & Pan Detergent can be diluted and used as an all purpose cleaning solution. It is the best for getting out food grease out of clothes even if they have been washed and dried a few time. I am so pleased!! !